This week I bring you yet another tooth. My goodness, you’d think I was obsessed with teeth! Or maybe even the dentist. But no, it just so happens the museum has a fantastic tooth collection–maybe it was started by a former dentist? Well, this fellow had some “good teeth,” as my dentist would say. Can you tell what family they came from? It’s a family you should already be familiar with, as it has been featured on Fossil Friday before. 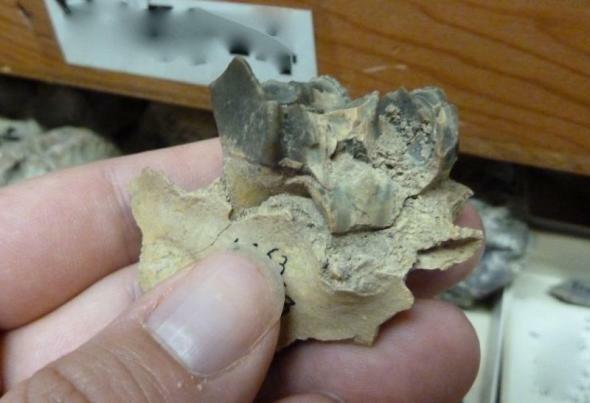 These teeth were found in Nevada, but I doubt they were lost in a prehistoric poker match. Who did they belong to?